Award-winning entrepreneur Nidhi Shah, WG’17, G’17, has set out to fill human needs, whether toilets for urban India through her social enterprise or free lunch on Fridays for her entrepreneurial classmates. Most successful businesses start by fulfilling a need. 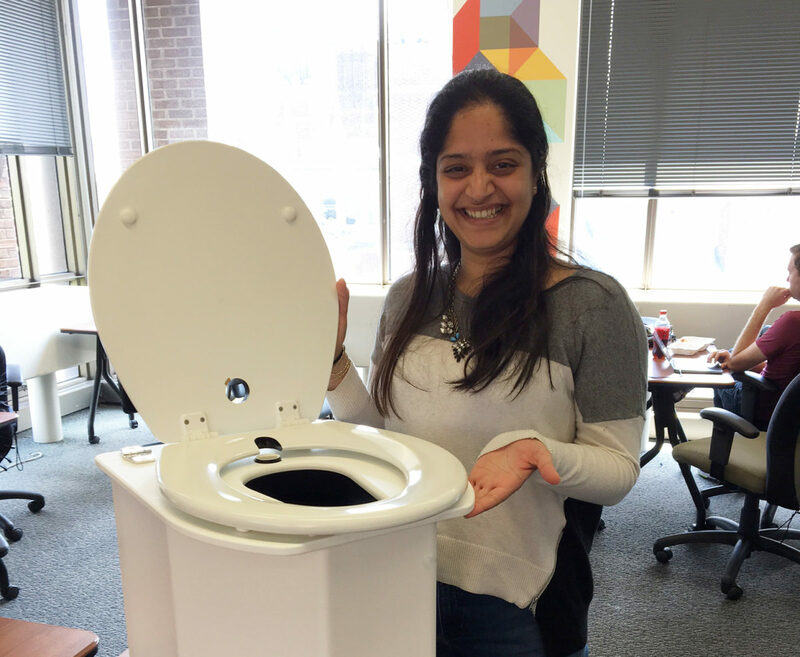 When Nidhi Shah, WG’17, began her business, she set out to fulfill one of the most universal needs — toilets. After all, everybody uses them. The idea is behind RevoLOOtion is to sell, install, and maintain non-networked composting toilets in both urban and rural communities in India. 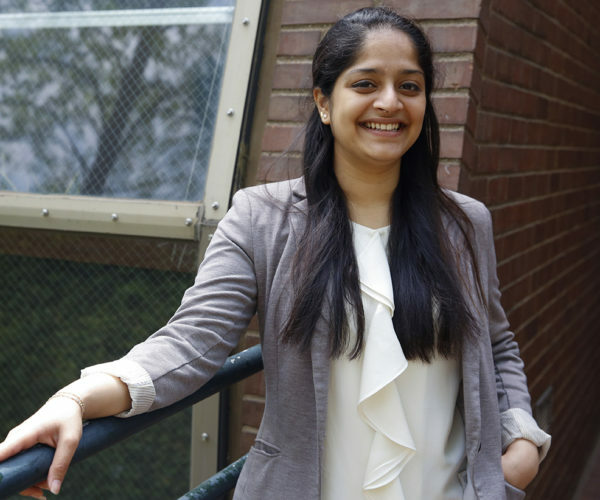 As a for-profit social enterprise, Nidhi’s venture has racked up support and awards, including the Santander Venture Award and Jacobson Global Venture Award, support from Wharton’s Venture Initiation Program, pilot funding from Infosys Foundation, and most recently the Social Impact Award in the Penn Wharton Startup Challenge. Nidhi has been fascinated with reducing waste since she was a middle-schooler pulling recyclables out of her family’s garbage. Nidhi recently graduated with a Wharton MBA and an MA in International Studies with a South Asia/Hindi concentration through the Lauder program. Prior to Wharton, Nidhi worked as a process engineer designing factories. “Two years into working, I had this existential crisis. ‘What am I doing with my life?’” she said. In her work as a chemical engineer, she learned about Toilets for People, which was working with NGOs to provide composting toilets for rural areas in Latin American countries. Soon she started to work for the sanitation startup on the side. She came to business school to gain skills to benefit Toilets for People, but around the time she was admitted to Wharton, she struck out on her own with the business plan that became RevoLOOtion. Nidhi and RevoLOOtion are targeting informal urban settlements in India. Nidhi chose Wharton and the Lauder program to gain better access to India, where she was born. She lived there for the first 11 years of her life, but she had never worked in the country and wanted to improve her Hindi skills.The two-month Lauder Summer Immersion in Delhi and Bombay got her to a flying start, allowing her to meet business people and cultural leaders while improving her Hindi language fluency. Nidhi met her business partner, Swathi Sadagopan, through LinkedIn when Swathi was working on a business plan competition with a related sanitation idea. Nidhi advised her, and after Swathi won, they decided to join ventures, even though Swathi is based in Canada. While Swathi handles sales and marketing, Nidhi is in charge of the product side, which is still in development. At Wharton Nidhi’s favorite courses were Entrepreneurial Marketing and Entrepreneurship, and Innovation and Product Design with Prof. Karl Ulrich. She took full advantage of Wharton and Penn resources for entrepreneurship, working on her business during the school year through the Venture Initiation Program (VIP) and over the summer using funding from the Lauder-sponsored Santander Venture Award and other sources. As a constant resident of the VIP coworking space in Vance Hall, Nidhi noticed that Fridays in the suite were not as busy as she expected. She realized that it was difficult for some of her entrepreneurial classmates to avoid the siren call of recruiting, not just for the security of a job rather than a startup, but for a simple reason — free meals. “You have so many employer information sessions where they serve you this really nice food, and there’s nothing like that for people who want to start their own company,” she said. She had the idea that the VIP program should serve catered lunch on Fridays, when MBA students don’t have classes and many spend time recruiting. She spoke to Valentina Goutorova, Senior Associate Director of Penn Wharton Entrepreneurship, and they worked to make it happen. At first they had a tiny budget, but later gained structure as the VIP program grew. Nidhi planned the first couple meals, working with LocalStove, an Uber-like catering company for home cooks founded by three 2016 Wharton MBAs. Now that Nidhi has graduated, she’s working full-time on RevoLOOtion, while her partner Swathi is still part-time. For Nidhi, the primary driver is having a positive social impact, with profit and growth to sustain the company. As driven as Nidhi is, she’s also extroverted, turning to standup comedy and performing in the Wharton Comedy Show as another outlet. Her comedy routine fits in with the whimsical name of her company.